Member photo albums are collections of photos that can appear on a member's profile. 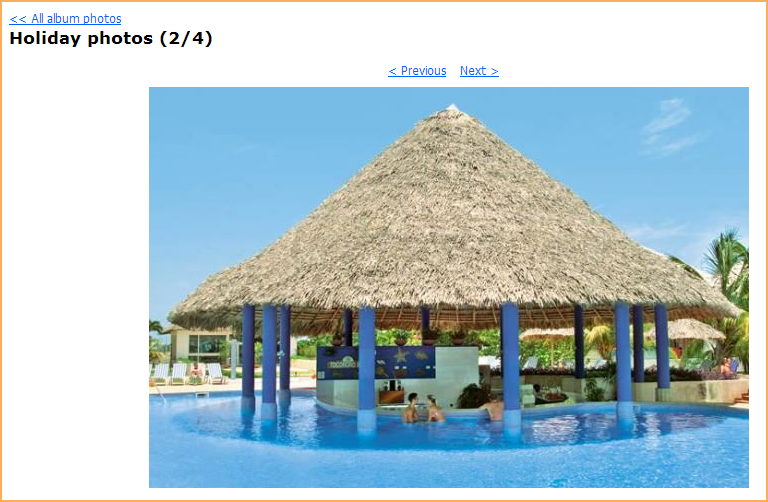 Member photo albums are different from the photo album pages that can be added to a Wild Apricot site. Members can create multiple photo albums and upload photos to their albums. 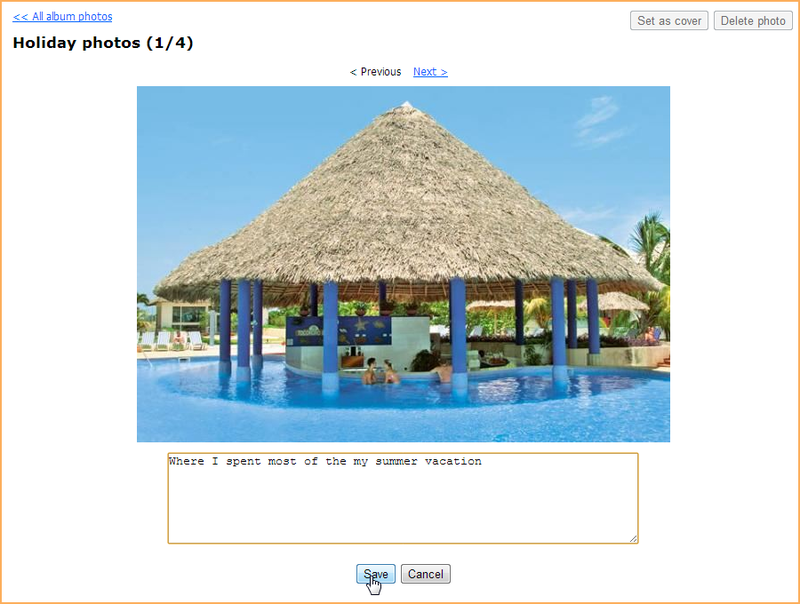 Members can add descriptions to their albums and captions to their photos. There is a limit of 50 photos for each member photo album. Photos added to member photo albums do not count towards your overall file storage limit. Administrators can control how many albums a member can add to their profile. 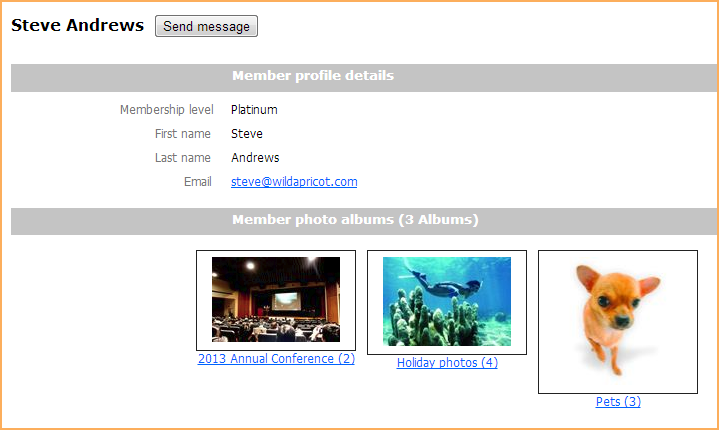 Both administrators and members can control whether other members and non-members can view their photo albums. Administrators cannot manage photos within member photo albums. Those who have been granted access to member photo albums can view them by clicking a member's name within a member directory page. On the member's profile, the photo albums will be displayed, using one photo from each album as the album cover. To view a photo album, the visitor clicks the album cover. Thumbnails will be displayed for each photo in the album. To view a larger version of a photo, click the thumbnail within the photo album page. On the individual photo page, the photo will be displayed as close to full size as can fit on the page. To view the full version of the photo in a separate browser tab, click the photo within the photo page. To scroll through other images in the album, click the Previous or Next links. Click the Settings menu then click the Privacy option within the Members section. On the Member privacy settings screen that appears, click the Edit button. Check the Allow albums checkbox. If you want to limit the number of albums that members can create, check the Limit to checkbox and enter the maximum number of albums. In the Show details area, click the appropriate radio button on the Member photo albums row to control who can view member photo albums. You can allow anybody to view member photos albums, just members, or allow viewing by no one other than the member who created them. When you finished adjusting member privacy settings, click Save. If you have changed the access settings for member photo albums, you will be prompted to choose whether to apply your changes to future members only, or to all existing members as well. After enabling photo albums for all members, administrators can disable them for individual members from the Photos page of their contact record. Administrators can adjust access settings for individual members from the contact record's Privacy tab. 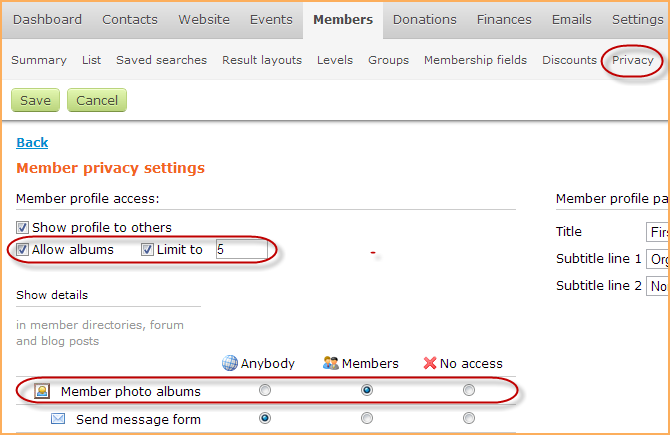 Members can also adjust access settings from the Privacy tab on their member profile. If access to member photo albums is set to no one, administrators can still view – but not delete – member photo albums from the Photos page of the member's contact record. Once photo albums are enabled, members can then create albums on their profile and upload images to them. From their member profile, members can add and delete photo albums, and change the name and description of each album. To add a photo album to their profile, a member goes to the Member photo albums page then clicks the Create album button, if they don't have any albums yet, or the Add album button if they do. On the dialog that appears, the member enters a title and description for the album then clicks Submit. The album title cannot end with a period. With the album now created, the member can change the title and description by clicking the Edit details button or delete the album by clicking the Delete album button. A member with a status of Pending - New cannot add photos to their member photo album. To upload a photo to an album, the member opens the album (if it isn't open already) then clicks the Upload photos button. 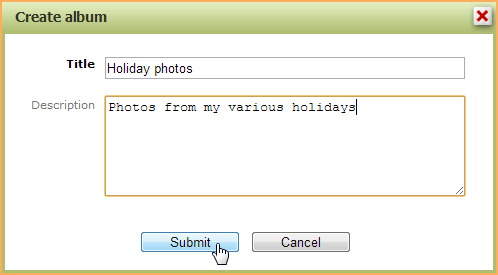 On the dialog that appears, the member can select up to 5 images to be uploaded at a time. Members can select photos saved using the following file formats: .jpg, .gif, .png and .tif. The maximum file size of each photo will depend on your billing plan. 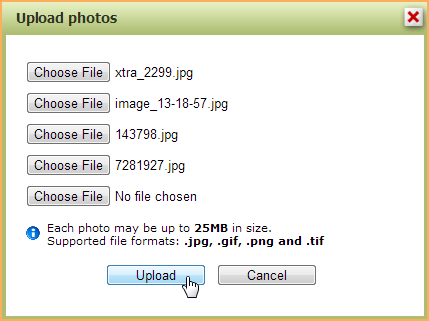 After selecting the files to be uploaded, the member clicks the Upload button. The selected photos will be uploaded and added to the photo album. After adding photos to a photo album, members can set a photo as the album cover, assign a caption to the photo, or delete photos. To set a photo as the album cover – so that the photo is used as the thumbnail for the album – hover over the photo within the album then click the Set as cover link. The photo will now appear as the first photo within the album, and as the album cover on the Member photo albums page. To assign a caption to a photo, click the photo within the photo album, then click the Add caption link that appears below the photo. In the field that appears, enter the caption then click Save. The caption will appear below the photo thumbnail within the album and on the individual photo page. 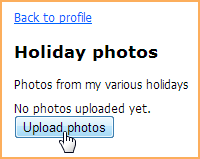 To a delete a photo, hover over its thumbnail within the photo album page then click the Delete link that appears. You can also delete a photo from the individual photo page by clicking the Delete photo button that appears in the upper right corner.